Today’s mission: make miles. We have 2 days to cover around 550 miles to home – do-able, but those are surprisingly long days on the Ural – particularly if we want to stop anywhere. Started off the day with the Comfort Inn continental breakfast. This one was a definite step-up from some of the other continental breakfasts we’ve had – there were hard-boiled eggs, the bread products seemed fresh, and they also had yogurt. We filled up on breakfast before loading up ourselves and the dogs to head out. Alas, I eyeballed my rear tire on the F650 as we were zipping up our gear, and I noted that it looked a bit low. Mentioned it to Kay. Said “we should probably check it, but I don’t really want to take the time.” He pointed out that I have a much better aptitude for spotting low tires than he does, and we haven’t checked pressures lately, so we pulled out the gauge and checked. It was around 10-15 PSI – not completely flat, but definitely way low. Sigh. Took off the jackets. Pulled the dogs out of the sidecar so we could unsnap the dog cover and get into the Ural’s trunk, where we’re keeping the tools and things like the Cycle Pump on this trip. Added air to the rear tire (after having yet more trouble with the stupid chuck end on the compressor – that’s my biggest complaint with the Cycle Pump) and decided to check all the tires since we had the compressor out and hadn’t checked lately. They were all just a few pounds low, so we added air to all 5 tires. Sigh. After problems getting the stupid Cycle Pump end to seat properly, and getting the pump put away, buttoning up the dogs, and re-gearing up again, we’d lost a half hour to airing up tires. Bleh. Still, we were in the Magnetic Hill part of Moncton, and Kay had never done one of those “driving uphill” optical illusions (I’d done one in Ireland and thought it was kinda awesome) so I insisted we head a few minutes down the road to check out Magnetic Hill. After all – we’re on vacation! There was a $5 fee per vehicle, but the guy waved us through since we were on motos. We waited our turn to drive down the road, but you were supposed to pull forward, and then roll backward in neutral. Turns out, that’s surprisingly difficult on a two-wheel bike (at least, I think it is!) – I tried it for half the length of the road, but then turned around so I could roll face-first the rest of the way down the road – much easier, although I think I lost some of the effect. Unfortunately, the car behind me didn’t wait until I had cleared the lane to start his rolling backward, and he ended up accelerating faster down the hill than I was, so he had to slam his brakes on to not hit me, and I had to roll on throttle to get out of his way, completely ruining the experience for both of us, I imagine. I left the attraction feeling annoyed. Side trip over, we hit the highway to cover miles. There was highway. And more highway. And lots more highway. The Ural still wasn’t riding well – Kay was maxed out on the throttle and only going 55-60MPH, and losing power up even small inclines again. So it took us a while to cover ground, and it was frustrating because the Ural didn’t feel like it was pulling properly. The highway in New Brunswick is surprisingly beautiful – lots of rolling hills, valleys and small mountains with an occasional ocean view. But it was just a frustrating grind for us. Stopped around lunch time to fuel up the Ural yet again, and Kay chatted for a few minutes with some bicyclists from Halifax who were riding across NS and NB and into the US for a month. We had gas station lunch, which turned out to be very lame – neither sandwich was good, nor were the potato chips we got, so we both gave up before finishing the food. Even my dog wouldn’t eat the potato chips, although Kay’s dog, a former street dog, was more pragmatic and was willing to much away at them. Back on the road for more grind. The day was passing so slowly at the speeds we were capable of going. And with Kay’s headset out of commission, we weren’t even able to chat to pass the time. It was just a long, boring slog. At the next gas stop, I pointed out that we could hit the Chocolate Museum today. We’d missed it on our way into Nova Scotia because we passed it too late in the day, but surely we could hit it early enough today. 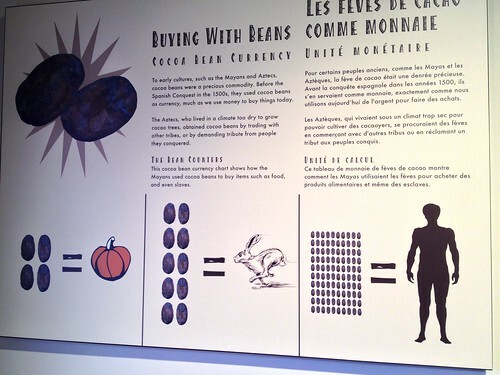 So that became our goal – get to the Chocolate Museum in time to check it out. We rode. And rode some more. And then it was around 2:30, and we were theoretically in the spot where the Chocolate Museum was located, except we couldn’t find an entrance for it. Kay walked through the little one-way cut through (one way in the wrong direction) and said there was a sign for the museum out front, but he couldn’t see it – but if we left the parking lot and essentially took a couple of right turns, we could come at it from the front and hopefully find it. So we did. As soon as we pulled into the parking lot in the front, I could see the Chocolate Museum tucked in a corner right in front of the one-way pass through we’d just left 10 minutes before. We’d literally been sitting on the other side but couldn’t see it because of where it was located. So we took off our gear, buttoned up the dogs, and walked in at 2:46. I know this, because the museum was supposed to close at 3pm, and when we talked to the girls at the desk, they told us the last admittance was at 2:45pm. By this time, the clock on the wall behind them said 2:47. “So we missed it by 2 minutes?” I asked incredulously. The main lady nodded. I looked at Kay. He looked back. He could see I was disappointed. After the boring, lonely, frustrating riding today, and the crappy lunch at the gas station, I had pinned my hopes on the Chocolate Museum for alleviating the crap of the day. I spoke aloud without thinking. I looked at her, surprised. “Oh, could we? That would be so wonderful. Thank you very much!” I paid our admission, and we tagged onto the group of college kids that was currently getting a private tour. The Chocolate Museum was small – only a few rooms – but it was full of interesting facts about the evolution of this particular chocolate company – Ganong Chocolate, who it turns out were the first people to ever make the Valentine’s Day heart-shaped box of chocolates – and chocolate making in general. I love chocolate, and I’ve toured some artisan chocolate factories before, so it was fun to see how a bigger, more commercial chocolate factory handled things. There were two groups undergoing private tours – one in each of the main rooms – and I didn’t want to intrude. I felt we’d been fortunate enough to be granted entry, and I didn’t want to take advantage of the ladies at the front who had been nice enough to let us in. So when it was 3:01, I made Kay and I break away without visiting the second room (we’d been waiting for the other group to finish in there) and head out. I hadn’t gotten to see the entire place, but what I had seen was cool, and the ladies being nice enough to let us in made me feel better about the day in general. We stopped at the little chocolate shop in the front of the building (which was open until 7PM – far after the 3pm close time of the museum) and tried to spend all of our remaining Canadian dollars on chocolate stuff so we wouldn’t have to have them converted back to US when we got home. We did manage to unload most of our change, which made Kay happy. And we got some chocolate treats, which made me happy. All in all, it was a win. Kay had to pee, and we’d need gas again for the Ural, so I checked the GPS for a gas station where we could walk the dogs, take care of our needs, etc. before dealing with the border crossing back into the US. Last year’s crossing from Canada to the US took something like 90 mins of waiting in the hot sun, including several long minutes being grilled by the border crossing lady. We wanted to make sure we and the dogs were prepared for the wait. So we geared up and got on the bikes to ride the half a mile to the gas station. Down the road, and around the corner… and wait! That’s a border crossing! The gas station was *just* on the other side of it. D’oh! Kay pulled into one lane, and I tried to pull into the other (there were only two lanes) but the guy in Kay’s lane motioned me over, and then he motioned me forward to behind Kay. “Even though it says to stop here until the vehicle in front is through?” The border guy nodded. Two minutes later, after a very perfunctory review of our paperwork and asking us a few questions about our vacation, he waved us through. We pulled the 100 feet forward to the gas station to take care of our stuff. Home! We were back in the US. Everyone in Canada had been super friendly, and we had absolutely zero complaints about our time in Canada… but even so, it felt nice to be back in the US in a way that neither of us could quite articulate. So we took a little break, walked the dogs, had a pee and figured out our game plan for the night. 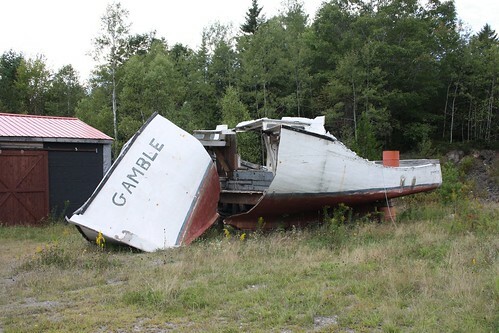 Kay suggested we head to Bar Harbor to camp for our one last night on the road. The GPS tried to route us via a direct route, but we decided we’d rather take the coastal Route 1 instead of more highway. So we did. It was nice riding. It was much more scenic than Route 9 we’d taken to head north to Canada. 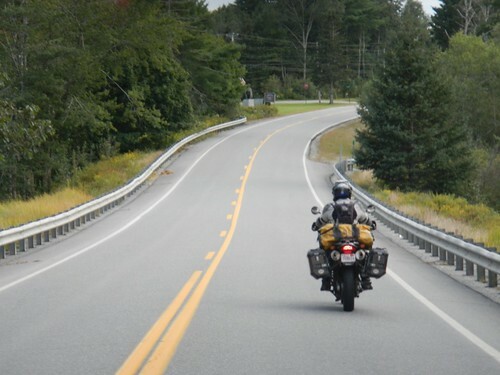 As a state highway that passed through numerous towns, it was slower and better suited to the Ural than the highway we’d been on most of the day in NB. It was a generally relaxing change of pace, and we even stopped once to get a picture Kay couldn’t resist. Alas, about 20 miles from Bar Harbor, Kay’s headset died entirely and he could no longer hear me giving him directions. Our only option was to change positions – me in front on the F650 although we usually put the Ural in front because it dictates our speed. A glance at the sky to the west revealed bigger problems: rain was coming. We’d have to forego food and hope traffic moved quickly enough to get us to a campground and get a tent set up before the rain hit. And alas, this meant we were stuck at the KOA at the edge of Bar Harbor, instead of one of the hopefully more primitive state campgrounds further down the road. Oh well. Get out of the rain before it hits. We hit the KOA, and Kay headed in to find out if they had a tent spot available. They did, and a guy in a golf cart guided us there. 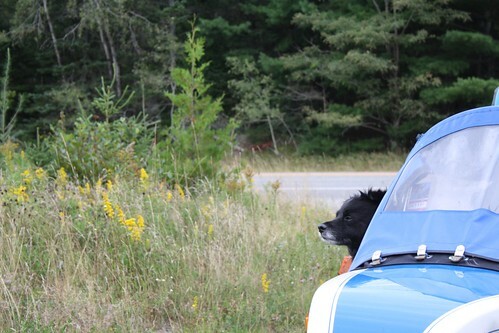 Along the way, the dogs started barking at a dog we were passing – and then I saw a woman pointing to the sidecar and saying that we had a dog on the ground. I turned around, and saw that ‘dido had somehow jumped out of the sidecar and was running along next to the wheel. But he was still tied in by his leash and harness! I shouted at Kay to stop, which he did, and he got Bandido back into the sidecar. I was horrified – the harness and leash were supposed to prevent that, but apparently he got so excited barking at the dog that he managed to twist his harness sideway and stretch the leash far enough to get out. YIKES! 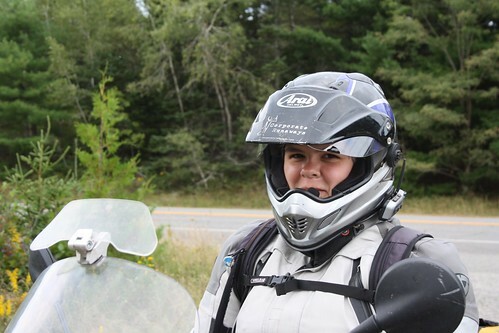 ‘dido safely back in the sidecar, and we made it the remainder of the way to the site and got the tent set up quickly. Then we walked the dogs over to a “lobster dinner” shack someone had set up right in the campground. ‘dido was showing no ill effects from his spill. I’m just grateful that it happened at a few MPH in a campground, and someone was close enough to point it out so we could stop immediately. After acquiring a ridiculously expensive lobster roll dinner (nearly $50, and it had such a weird taste that neither of us even finished it! What is it with disappointing meals at the end of this trip?) ‘dido was extremely bouncy and runny headed back toward the tent. So I ran around the campground with the dogs (literally) while Kay juggled all the food back to our tent. Then Kay had to run to the front office because the vending machine back by the tent area had eaten my money, and was out of all the beverages, apparently – but it turns out that the front office and store was a surprisingly long way away, and it took him like 15-20 minutes to get there and back and that included running part of the way. Ate (and discarded) our lobster dinner, and enjoyed listening to the sound of rain on our tent on our last night of the trip. Tomorrow, if all went well, we’d be home. It was bittersweet. I was tired of getting rained on, and tired of spending more time in hotels than we’d planned. Watched an episode of Top Gear on the iPad and just relaxed, instead of trying to pull video or photos or write up posts.